Our annual trip to the Woodbridge Christmas Fair. 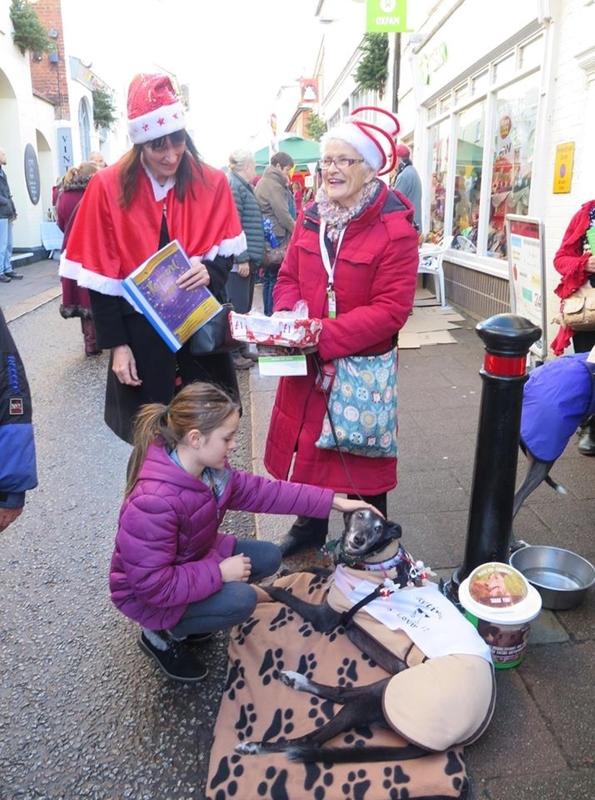 Thanks to all the volunteers that helped out and to all who donated money and treats for the greyhounds at Christmas. Kennel dogs the Doctor and Seb enjoyed a day out from kennels and coped admirably with all that was thrown at them, and enjoyed the attention and the cuddles. 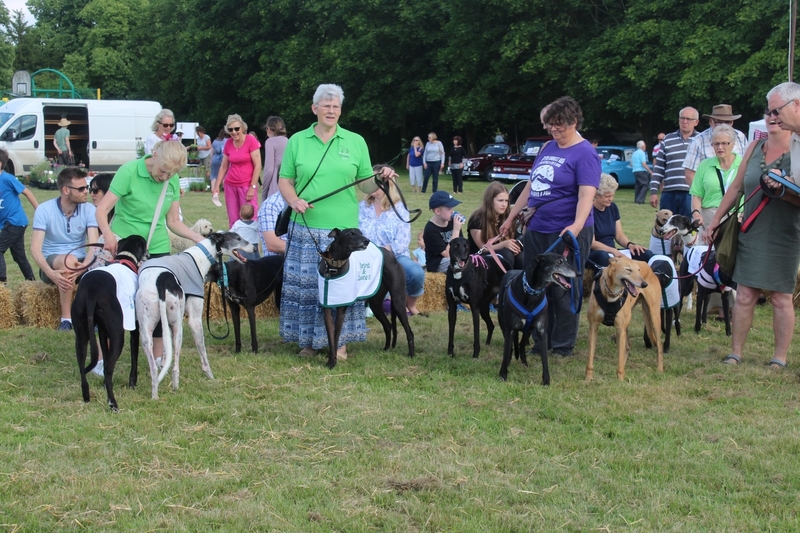 Due to the bad weather forecast for the weekend the organisers of the Boxford Dog Show have taken the wise but regrettable decision to cancel the dog show due to be held on Sunday. They hope to be in touch with a revised date shortly. We had a busy time at the Bentley fun day today where we ran the Dog Show. Some absolutely stunning dogs took part and were all so well behaved they are a credit to their owners. Many thanks to Judge Julie who had the unenviable job of picking the winners! 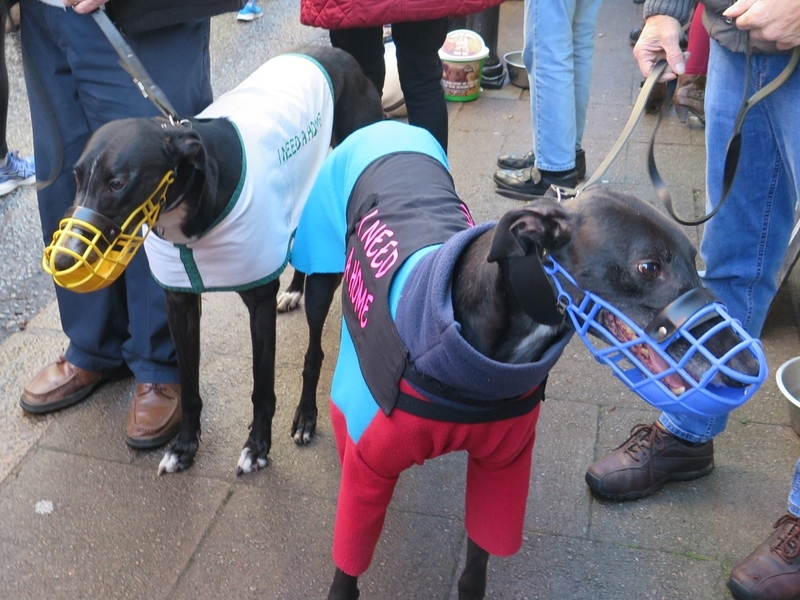 Kennel dogs Casey and Bambi came along and were amazing, future greyhound ambassadors in the making. It was a fine day for the Tattingstone Fete. We were joined by kennel dogs Conrad and Jon who were amazing given this was their first social event. Graeme Marsh from the Head Office team and his greyhound Reef came along to lend a hand and to meet the team. 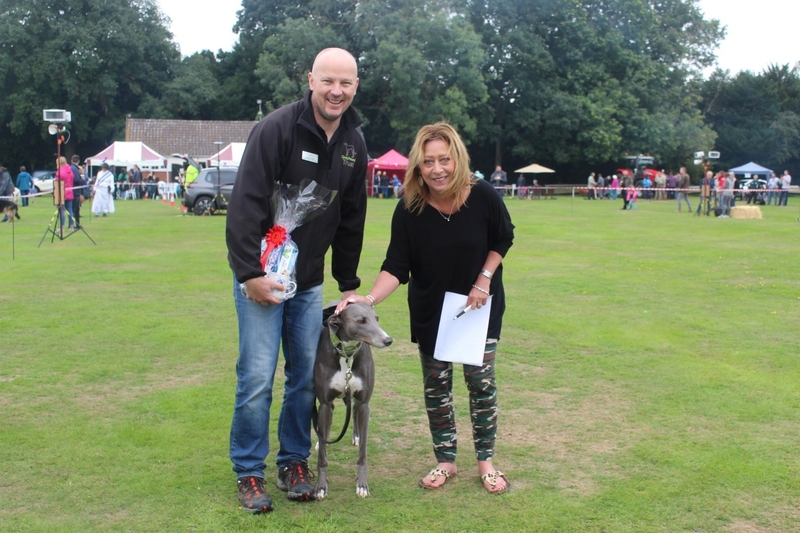 Well done to Reef, he won the most handsome dog class. Our next show will be on Saturday 8th September when we will be at the Tattingstone village fete and fun dog show. 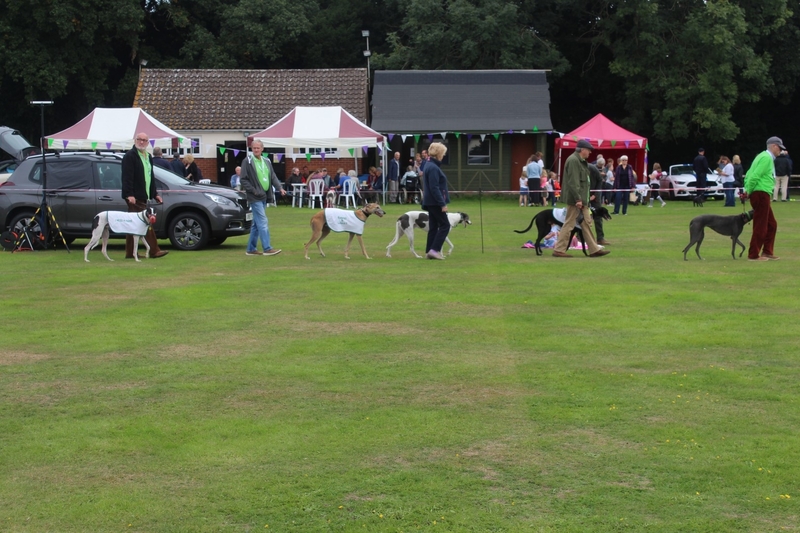 Why not come along with your beautiful hounds and take part in the parade of greyhounds or in the dog show itself. We will have an extra pair of hands to help us on the stall. Graeme Marsh Marketing, Communications and Events Manager from the Head Office team will be joining us for the day. Afterwards he will be helping us to set up for the following days Bentley fun day but ssh we haven’t told him that bit yet! For details of both events please see the What’s on page. We had a lovely day at the Greyhound Walks Show. Kennel dogs Chico, Java and Milly came along and we are hopeful that as well as coming 3rd in the 4 years and younger class Chico may have a home. Thanks to our fabulous hard working ambassadors Roy, Spring, Bailey, Queenie, Lucky and Flossy for bringing their families along to help us. We will be at the Tendring Show tomorrow. Our stand number is A9 so if you are going to the show do stop and say hello. Due to the extreme temperatures forecast we will not be taking any kennel dogs along but have lots of goodies for sale. Full details of the venue can be fount under our whats on section. 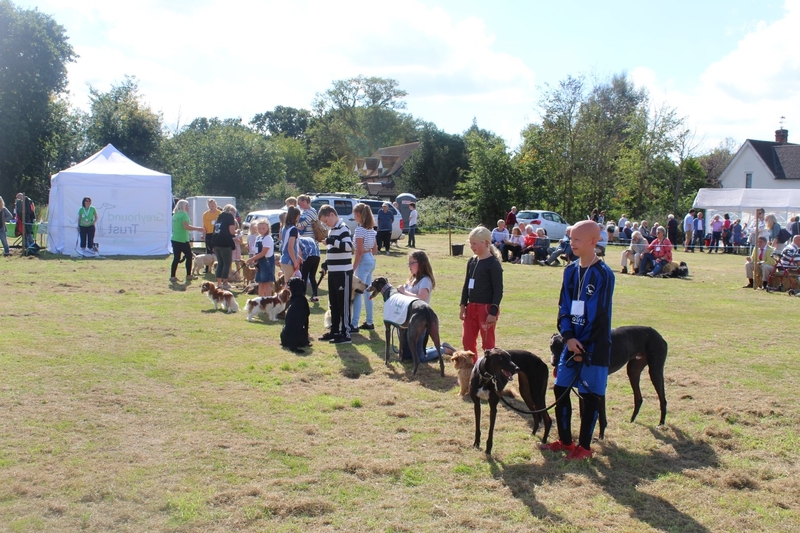 Our National Greyhound Day event was spent at the Monks Eleigh Fete. We took kennel dog Lofty along in the hope of finding him a home, he has waited such a long time. 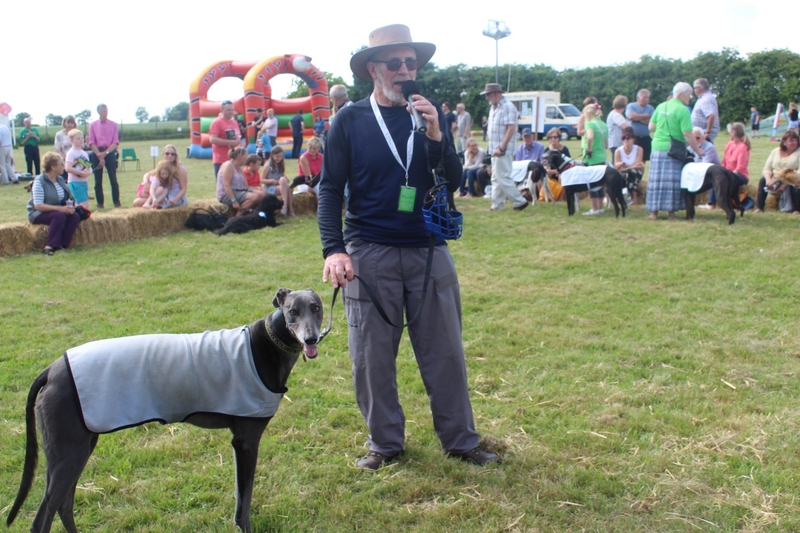 Volunteer Terry who was ably assisted by Davey (Millwards Davey) gave an interesting and informative talk in the show ring about the history of the Greyhound while our volunteers and supporters paraded their hounds. This is a fete we will be attending but will not have a stall. 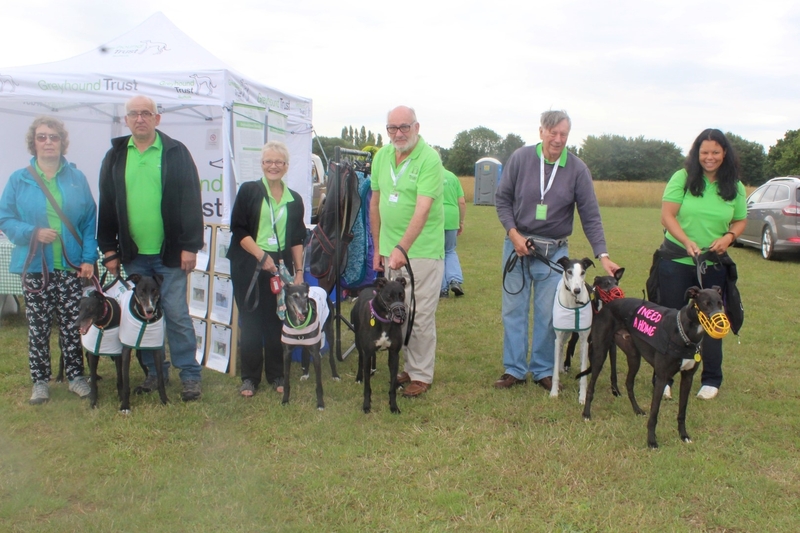 If you would like to come along we would be very pleased to see you because Volunteer Terry will be giving a presentation on greyhounds and we have been asked to parade our greyhounds in the show ring so the more the merrier.